Winter-to-early spring non-monsoonal precipitation over the Western Himalayas (WH) primarily comes from eastward propagating synoptic-scale weather systems known as western disturbances (WDs). Earlier studies have noted that an increasing trend of synoptic-scale WD activity in the past few decades has contributed to enhanced propensity of daily precipitation extremes over the WH, although it remains unclear as to whether these regional changes are manifestations of climate change. 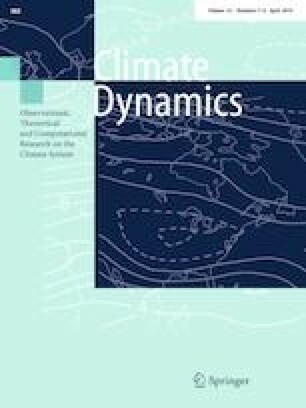 This issue is addressed by conducting a suite of long-term climate experiments using a global variable-grid climate model with high-resolution telescopic zooming over the South Asian region. Our findings highlight that human-induced climate change has implications on the rising trend of synoptic-scale WD activity and precipitation extremes over the WH during the recent few decades, and these changes cannot be explained by natural forcing alone. A stronger surface warming, in response to climate change, is noted over the vast expanse of the high-elevated eastern Tibetan Plateau relative to the western side. The model simulations show that strengthening of positive east–west temperature gradient across the Tibetan Plateau tends to alter the background mean circulation in a manner as to favor amplitude enhancements of the synoptic-scale WDs and orographic precipitation over the WH. With continuation of global warming in future and enhancement in the east–west temperature gradient across the Tibetan highlands, the trend of precipitation extremes over the WH and synoptic-scale WD activity are projected to rise into the twenty-first century. While the high-resolution simulations of this study offers promising potential to understand changes in synoptic-scale WD activity and precipitation extremes over the WH, further investigations are necessary to decipher the multi-scale behavior and intricacies of the Himalayan precipitation variability under changing climate. The online version of this article ( https://doi.org/10.1007/s00382-018-4357-2) contains supplementary material, which is available to authorized users. The high-resolution LMDZ4 simulations were performed on the IITM HPC. The authors are thankful to Director, IITM for providing all the support. IITM is funded by the Ministry of Earth Sciences, Government of India. The authors thank the two anonymous reviewers for their suggestions. This work is carried out under the MoES-Belmont Project Globally Observed Teleconnections and their role and representation in Hierarchies of Atmospheric Models (GOTHAM). RKM was partly supported by the NORINDIA Project 216576/e10.